Salaam to you my dear sister. My name is Manizha and I am a housewife. I have five children. What I know about my life is that it is an interesting story. When I was a child I had six brothers and sisters. My mother worked outside the house as a government employee and my father was a teacher in Kabul. My father didn’t want my mother to work outside and have a job. Because of this, the relationship broke down and my mother got divorced from my father. There was a fight in the house and my father had to turn us away. We were in the street and we didn’t know what to do or where to go. I was the oldest and my brothers and sisters were very small. By the evening of that day, a woman in our neighborhood offered to take us in, and so we went and stayed. It then happened by chance that a family with no children was able to take my youngest brother in. The man said that he had no child and he would bring up my brother like his own son. My other four brothers and sisters and I remained in our neighbor’s house. We waited in hope that my father would come and take us, but he never came. In the house of my neighbor we were brought up, but I knew I was homeless. Because I didn’t have my mother with me in my earlier life, there was nobody to show me how to work around the house, how to sew or how to cook. I lived with a stepmother, and I learned to wash the dishes and do the cleaning. I grew up like this while my brothers and sisters dispersed and went to work as servants for different houses. I became a young woman quickly because I had to continue life and had no other choice. I married this son and now I am the mother of my children. Now my life is worse than my mother’s life. My children are young and life is extremely hard for me. For a very small thing, my husband fights with me and gets very angry. Two times he burned me with hot tea water. Twice I made a complaint to the justice office against him. We fight all the time, but I don’t want to divorce him. I don’t want my children to have the same destiny that I had. I won’t let my children be lost in the street with only strangers to help them, people who help only because of God and to get rewarded by God. Because of my children I accept any conflict and tolerate it. I don’t want my children to suffer like me. This was my life story and I hope that my story could be a lesson for other Afghan women. I request from all my brothers and from all men: Please, understand women and observe women’s rights. 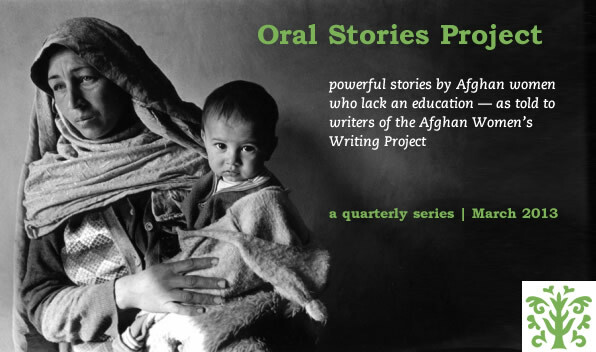 Editor’s note: This story is from an oral interview with Manizha conducted as part of the March 2013 AWWP Oral Stories Project. This is an injustice. You must be very careful that your children do not learn that it is O.K. to treat women this way. Teach them to be kind to women and not to learn the way of this mean man. It is NOT right to burn or hit women. Hi,thanks for sharing your story. you should know that it is not okay to treat a women like this. you never know what the future holds and your children may not have a future like you and your siblings. just keep hope and eventually things will turn out right. Hi, your story is very touching, and I thank you for sharing it. Reading your story made me realise how hard life is for many women in this world. You are such a strong woman who loves her children so much. You are a great example of a loving mother and a patient wife. It is never right to be hit and disrespected, regardless of your age and race. It is best to have faith in yourself, and always hope for the best. Salaam, thank you so much for sharing your story, it was inspiring and emotional. I think that the fact that you had the courage to share your story is amazing. The way that you’re protecting your children from this world is a brave thing to do. I hope that I can assist in changing this from happening to the future generations. Thanks.